Fixation must be strong enough to allow early ROM to limit extensor tendon adhesions. Supine with hand table, tourniquet high on the arm. All bony prominences well padded. 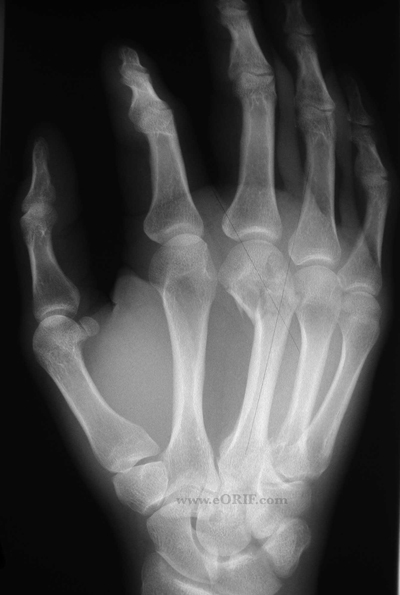 Dorsal longitudinal incision over affected metacarpal. If two metacarpals use single incision between them. Fracture exposed by subperiosteal dissection from lateral side of extensor tendon to mimize tendon adhesion. Mini-condylar plate placed dorsally. May be placed radially on 2nd metacarpal, ulnarly on 5th metacarpal. Pre-bend plate as need to prevent gapping in opposite cortex. 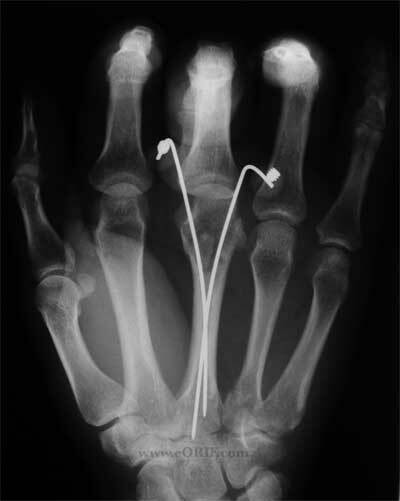 Two 0.045 k-wires placed in the collateral recesses of the MC head across fx and into subchondral bone of MC base for 3-4 weeks. 1Yr: F/u xrays, assess outcome.